Rosacea is a common benign long-term skin condition that affects individuals over the age of 30. It causes redness that mainly affects the face. Which areas are affected by rosacea? Rosacea typically involves the central region of the face, mainly the forehead, cheeks, chin and the lower half of the nose. It presents as redness, pimples, swelling, and small and superficial dilated blood vessels (called telangiectasia/thread veins). Some patients can develop papules, pustules, and swelling. In severe disease, a red enlarged nose can develop, a condition known as rhinophyma. The exact cause of rosacea is unknown. Triggers include exposure to extreme temperatures, strenuous exercise, menopause, psychological stress and severe sunburn. Alcohol and beverages containing caffeine , foods high in histamines, and spicy foods have also been linked to this condition. Treatment outcomes for rosacea vary depending on its severity. 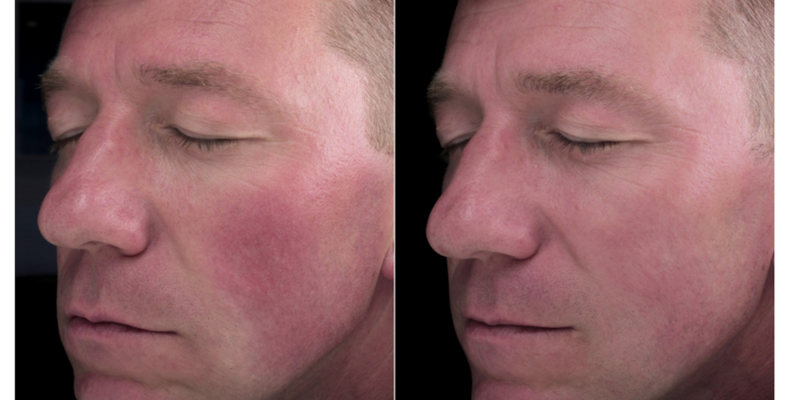 Treatment of rosacea is not curative, the aim is to manage the condition by reducing the appearance of symptoms. At Bedford Skin Clinic the treatments we offer for rosacea include topical and oral antibiotic agents, Obagi Rosa Clear System and laser therapy.